[Concluded] [Valentine's Day Special Giveaway] DesignEvo Lifetime 5 Basic Plan + 3 Plus Plan. Discussion in 'Giveaways and Contests' started by whizkidraj, Feb 9, 2018. DesignEvo is a free online logo maker with 3000+ templates that anyone can use to bring to life a compelling, unique logo in minutes. 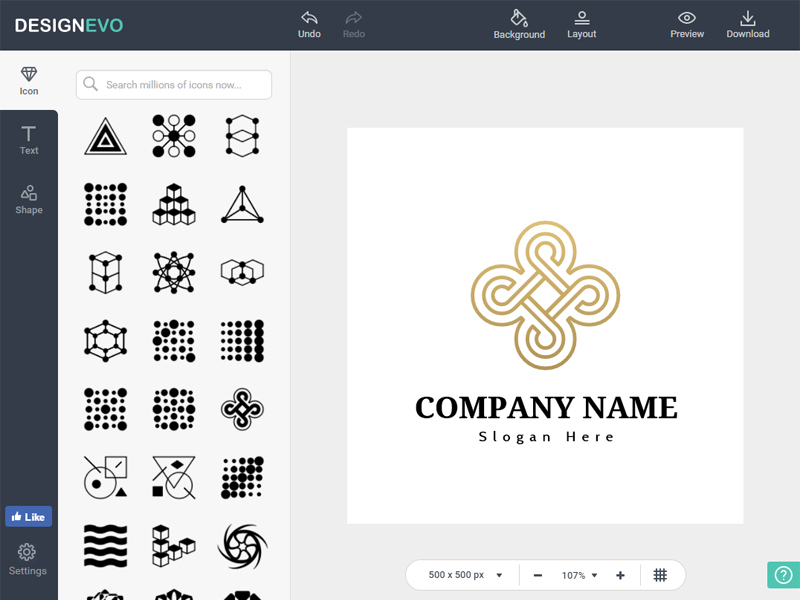 When looking for a tool that can help you to make abstract logos, DesignEvo's logo creator is what you need. Whether you want to create a logo for your shop, studio, or company, an abstract logo, such as an arrow logo, star logo, circle logo, and triangle logo, is a good choice, and you can find a perfectly suitable design from hundreds of prepared logo templates. Play around with millions of icons, beautiful font styles and shapes; you will get a custom design you want. 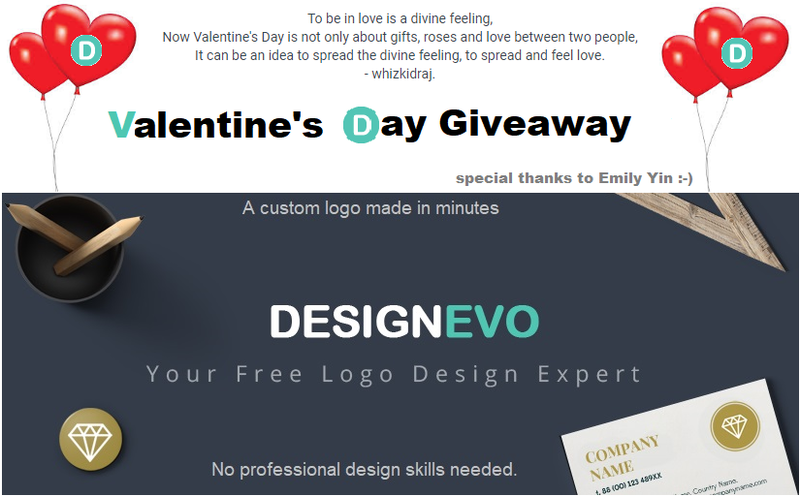 I would like to thank my dear friend Emily Yin, and everyone at DesignEvo for sponsoring this sweet ♥ and generous giveaway for our awesome forum members. Each coupon is only limited to one logo project. As always, simple rules. But please comment something that should indicate that you want to enter this competition. Not just thanks or other one word comments. Giveaway ends on February 26th, 2018. Currently working on a Logo for my son, so this would be very handy. Anybody can create a logo or custom logo for anything you want to design I create one for my laptop without signup. I can own the copyright of the logo in Plus package I hope I win one Plus. Thanks @whizkidraj for the giveaway. full customization and completely free download of the finished work. Wow, what a cool giveaway. Thanks again for it. I will be interested to take part in this giveaway to receive a key for such a fancy software. It will be helpful to create a logo for my visit cards. Thanks a lot whizkidraj, Emily Yin, and everyone at DesignEvo for this giveaway! Thank you @whizkidraj for the gift. DesignerEvo is a useful logo making tool which offers a vast collection of icons, fonts and pre-built logo templates for independent professionals, small business owners and startups to create professional and fashionable business logos at no additional cost. You are also able to add background image/photo with the available tools provided. As a conclusion, it is easy, free and you do not even need to register to use it. Love means "Eternity and Life" to me ! I need a program to create logos, icons, beautiful styles and forms of the fonts to get an individual design. Love is an intangible, high, unpredictable, tender and natural feeling that makes a person better, more generous and sublime. Thanks a lot for the giveaway. I need this to make logos for my friend's website. Love is one of the eternal pillar on which this whole world stand, without it life is empty. Could prove very useful sooner or later. Seems to be a great product and with a huge amount of designs. Designevo has some very good ratings in reviews. Thnx to MDL, whizkidraj and Emily Yin for this great giveaway. 3 DesignEvo Plus Plan account winners. 5 DesignEvo Basic Plan account winners. Winners have 3 days to pm me to claim their win or else next person in the list will become the new winner. Thank you once again to whizkidraj, Emily Yin, and everyone at DesignEvo! 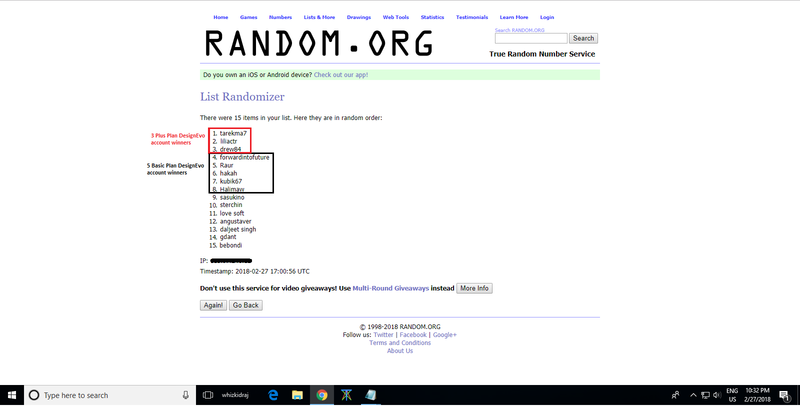 Thanks a lot and congratulations to the other winners!